This has been a year of transition, growth, experimentation, and opportunity beyond what I could have imagined or expected, and I am grateful. Summer marked the end of school and was full of travel, time spent with friends, preparation + execution of another art show, beginning new jobs, and transitioning into a different rhythm of life no longer defined by being a student. While continuing to live and work locally, I am exploring ways to grow as a human and as an artist; to create, to learn, and to experiment. As I begin to feel the change in season, I am reflecting on what the summer has been and how fall has begun; looking back with gratitude for what has happened and with hope for what is to come. Friday, the 5th of October, marked the second of the two first solo shows I’ve had this year, this one at Dye Pretty Salon in Winston-Salem. Putting together this exhibition was a new experience. I learned so much from both creating a body of work and curating + displaying it, figuring out the logistics of it all, and promoting + putting together an opening night. The creative license I was given-to essentially make whatever I wanted in whatever medium I wanted-was simultaneously paralyzing and liberating. I knew that for this show I wanted to incorporate new media, particularly clothing, into the context. I’ve found myself being more and more drawn to textiles- fabrics and the patterns on them, textures, colors, threads. I’ve most recently enjoyed up-cycling garments by means of hand embroidery and patch-making. These are the primary mediums I’ve been using to create work for my independent clothing brand, PATCHES, which I officially launched about a year ago. See this blogpost for the story. I’ve drawn collective inspiration from a variety of different artists, eras, and cultures. This exhibition was focused on clothing pieces, paired with some pen and ink drawings. I displayed my work in stark, minimal groupings. Most of my hand embroidery and stitch work held consistent motifs of organic forms and botanical designs inspired by nature + folk style embroidery- contrasting with the more organized and repetitive stitching found in other pieces, many of which were inspired by Japanese sashiko patterns. 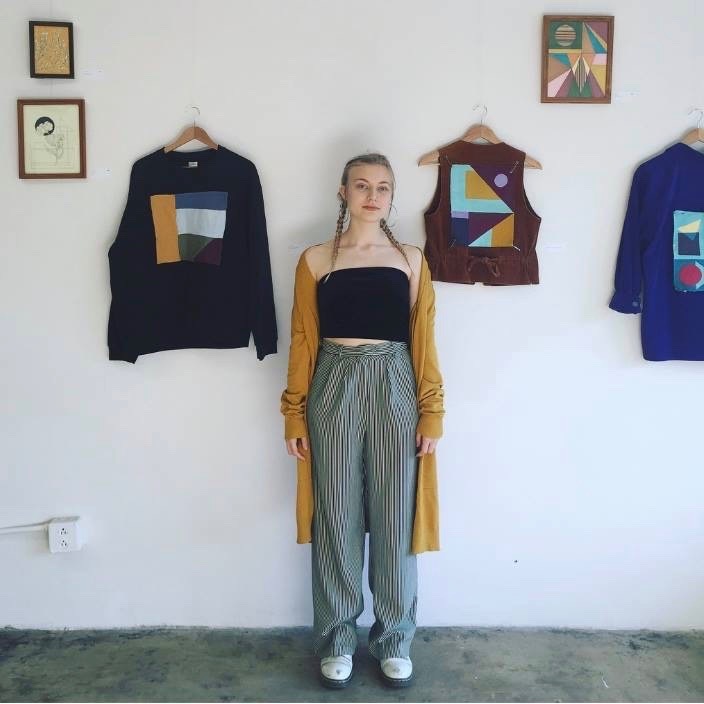 Patchwork jackets and tops were created with a lot of geometric shapes and bright colors, with hints of inspiration drawn from art deco, constructivist, and bauhaus movements, as well as contemporary artists such as Kristin Texeira (one of my all time favorites! ), Anna Mac, and Tessa Perlow. Special thanks to Whitney and Debbie at Dye Pretty, Chloe Brewer and Amy Badgett, and Raysa Suarez Williams for all being my rock and making this possible! I couldn’t have finished it all on my own without these badass women! Thank you to my friends and family for coming out + your continual encouragement and support of my creative journey. Throughout the past several months, I've been in the process of refocusing + developing my creative brand. I'm grateful for the opportunities this past year to have shared this new work with the community through local art markets. This year, I'm planning on revamping + reopening my Etsy shop, PatchesClothingCo! Here's the story. With a love for all things recycled, upcycled, and thrifted, I always discover myself with extra clothing and found materials in my studio. I began to experiment with these pieces by altering + embellishing them by means of paint, embroidery, and print. I quickly built up a small collection of upcycled clothes & folks began to take interest in wearing my designs. Patches Clothing Co is an independent clothing and art brand established in 2017. 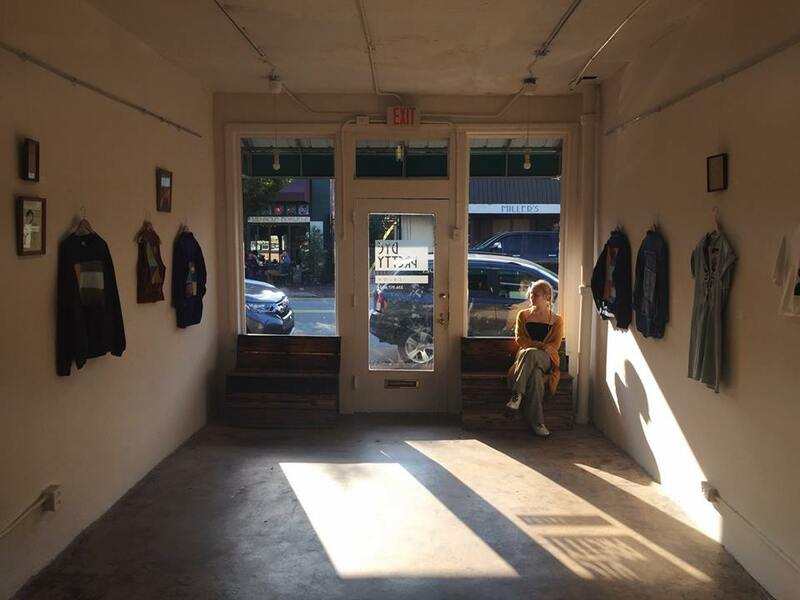 Formerly working under the name Artfully On Sunset, I sold a variety of handmade products + artwork, primarily in local markets, staring around 2013. Through Patches, I am refocusing my creative brand into a more specific concept: bringing new life to old things. I strive to create work that is unique, expressive, and ethically produced. Each handpicked article of clothing I alter has been freely exchanged or purchased used. This means that the clothing I design is one of a kind; each piece is different, each piece is conceptualized with individuality + created with thought. Patches is both a clothing brand and a creative brand. Along with wearable pieces, I also design and produce a variety of artwork including hand embroidery, paintings, prints, jewelry, and paper goods. The name Patches represents the creative mending of old things along with the eclectic nature of my artwork.
.:: the afternoon you made a mobile & I made garland ::.